Nepalese rescuers gather around a passenger plane from Bangladesh after it crashed at Tribhuvan International Airport in Kathmandu, March 12, 2018. A Bangladesh aviation official on Monday challenged a Nepalese committee’s investigation, which said actions by a disoriented and emotionally troubled pilot caused a US-Bangla Airlines plane to crash last year, killing 51 passengers and crew. 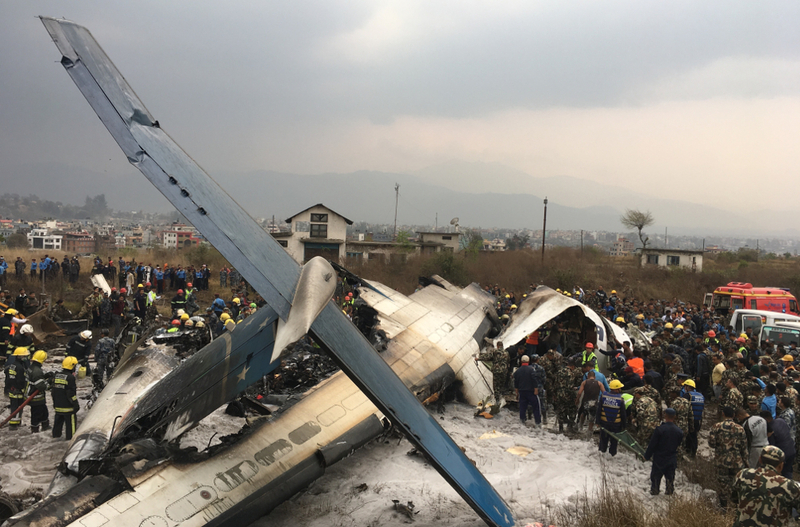 Errors by air-traffic control (ATC) contributed to the crash of flight BS211 at Tribhuvan International Airport in Kathmandu on March 12, 2018, but Nepal’s official findings on the accident overlooked this factor, Capt. Salahuddin M. Rahmatullah alleged as he reacted to the report. “No air crash can be personalized. The finding that came up in the Nepalese investigation was not completely right,” Rahmatullah told BenarNews. “It solely blamed the pilot. But they skipped the flaws of the air traffic control,” said Rahmatullah, who heads the Civil Aviation Authority of Bangladesh (CAAB) aircraft accident investigation group and served as Bangladeshi representative on Nepal’s investigation committee. The plane crash killed 28 Bangladeshis, 22 Nepalese and one Chinese. The pilot, Abid Sultan, and his co-pilot, Prithula Rashid, were among those killed while more than 20 people were rescued after the crash. The Nepalese government formed a technical investigation committee, which issued a report Sunday that blamed the pilot and said he had suffered an apparent emotional breakdown while attempting to land the Bombardier Q400 turboprop at the Tribhuvan airport. Rahmatullah urged Nepalese authorities to include in an updated version of their report what he described as erroneous actions air-traffic controllers at the Kathmandu airport. “The pilot missed the approach while landing. The ATC could have corrected him. But they did not do it,” Rahmatullah said. “If they fail to do it, we will turn to the International Civil Aviation Organization in this regard,” he warned. Rahmatullah said the crash could have been avoided. “A pilot could have made a mistake in his judgment. But the ATC was there to correct him,” he added. “They always monitor flights. But unfortunately, the ATC did not perform its vested duty to correct the pilot. The ex-president of the Bangladesh Pilots’ Association expressed similar concerns. “The accident happened because of faults of both, the pilot and the air traffic control. The pilot could have refrained from landing and gone up when he saw the danger, and contact the control tower again to get fresh instructions,” S.M. Nasimul Haque told BenarNews. Air traffic controllers made mistakes as well, he said. “Instead of permitting landing, they could have instructed the pilot to ‘go around,’ in that case, the crash would not have happened,” he said. Bangladesh’s former civil aviation and tourism minister said Nepal had blamed the pilot to save its image. “Nepal’s economy depends on tourism. Tribhuvan International is known as one of the riskiest airports in terms of operation. Flight operations at the airport may come down if the US-Bangla airline crash is attributed to the faults of the airport’s air traffic control. The number of tourists will fall,” retired Col. Faruk Khan told BenarNews. “So, they have been trying to point a finger at the pilot. Everybody can understand that no air crash takes place because of a single factor,” Khan said.